8:40 – 9:30 Data Protection & Privacy: Where’s It All Heading? the enforcement of heavy handed anti spam laws that motivate you, an understanding of where we are today and where this all appears to be going, is time well invested. Adjusting your internal email processes and practices for every law that comes along is just not practical, nor cost effective. Laying a strong foundation based on Privacy By Design and Default can get you part way there. Setting your internal email practices based on the “highest bar” rounds it out. We will address the specifics of how to go about dealing with this complex new topic. Remember, email marketing is NOT a numbers game. More is not always better. There will be lots of time allotted for specific questions from the audience. Email moves quickly and every day brings a different challenge as you try to get your messages into your subscriber’s inbox. Learn about new and emerging technologies you can take advantage of right now to make your messages stand out in the inbox and increase the likelihood of delivery to a subscriber. Topics include domain and IP reputation, list bombing, and new technologies enabling a brand to protect both subscribers and employees. Additionally, fresh research into the world of phishing, brand protection, and brand identification will all be explained so you can engage with your IT staff to implement them. The sky is the limit when you are considering ways to connect with your customers. During this session Mike will discuss processes and tactics that email marketers can use to amplify their email marketing programs to increase engagement, conversions and customer satisfaction. Can you believe that the Canada’s Anti-Spam Legislation (CASL) is ready to turn 9 this year, and will have 5 years of enforcement as of July? Do not miss this opportunity to hear from the CRTC as they discuss current enforcement priorities and initiatives related to advertising and marketing. In this session you will hear from the CRTC’s Director of Electronic Commercial Enforcement on the Commission’s 2018 activities, the trend on complaints and their enforcement focus for 2019. Learn about the latest guidance on Section 9 and how that can impact your business and those of your partners. Marketers today know they need to shift from a channel marketing approach to one where messages align cross-channel, centered around key audience data – this is where email marketers are uniquely poised to take a leadership position, and help break down internal silos and legacy processes that create friction and impede performance. Our panel of cross-functional agency and client-side experts discuss how they worked to build function, efficiency and accountability – while also moving the needle on longer term roadmaps to grow programs and capabilities. Topics will range from the email design process, selecting the right MarTech, internal and external standards, and building executive buy-in to advance capabilities. 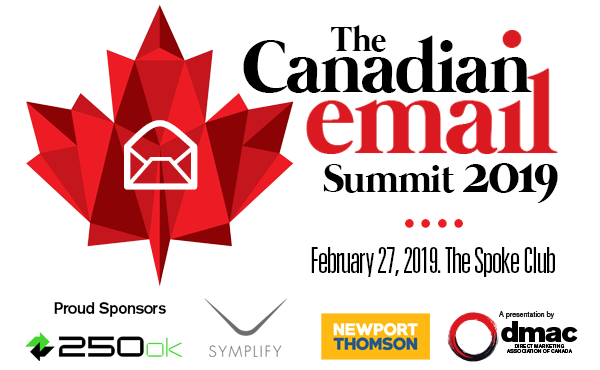 A panel discussion to cover the future of email. Looking back over the content of the day, and discussing where are we going and how are we going to get there. Topics will include marketing automation, privacy, career path development, and more.